When you think about “church”, do you think about “a” church or “the” church? Or both? Which most often? And does it matter which term we use when? Baptism and the Lord’s Supper structure the church. Scripture teaches that baptism is the front door of the church, and the Lord’s Supper is the family meal… Removing baptism from membership erases the line Jesus himself has drawn between the church and the world. 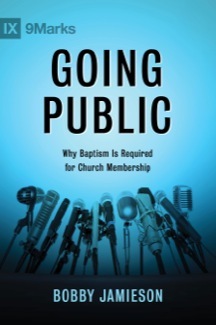 —Bobby Jamieson, Going Public: Why Baptism Is Required for Church Membership (Nashville, TN: B&H Academic, 2015), pp. 2-3. Is baptism the line between “church” and “Christian,” or between “church” and “the world”? (Both are asserted above.) If the former, does this leave some Christians in the world? If the latter, then how can some Christians be rightly excluded from church (either “a” or “the”)? So, when Jamieson is talking about “membership,” is it membership in Christ’s church (“the”), or membership in some local church (“a”)? What about when we speak of membership? Which way does the Bible use the language of membership? Or does it somewhere distinguish between two kinds of membership, so that we can talk of both? If so, where? In proposing this wording, I’m assuming what the author has made clear in context: that we are talking about someone who has been baptized, and about a local church responding to such an already-baptized person. Baptism is designed to be and mark the entrance into both the new covenant and church (both “a” and “the”). The entrance into both (new covenant and church) happens at the same time. You can’t truly belong to either one without truly belonging to the other. Churches should do their best to reflect this reality in their membership practices. Of course, such assertions need rigorous biblical support, which I am not providing in this brief post. For now, I mainly want to point out this: Sometimes it is way we use little things like articles (“a” or “the”) and possessive pronouns (“our” or “Christ’s”) that most powerfully shape and reveal our deepest assumptions and priorities. Therefore, pay attention to your “articles of the faith”! As I continue reading Jamieson’s book, here is my goal: Since I already agree with his main point about the integral connection between baptism and church membership, I’m going to listen closely to what he understands about membership and its relationship to the local and/or universal church. I think both Baptists and Mennonites have things to learn here. Thanks for listening in to my unfinished thoughts. Share your insights or questions in the comments below.